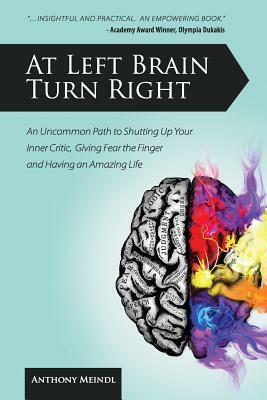 At Left Brain Turn Right: An Uncommon Path to Shutting Up Your Inner Critic, Giving Fear the Finger & Having an Amazing Life! (Paperback) | The Drama Book Shop, Inc.
15 weeks and 25 ways to unleash your inner Brando, Einstein and Shakespeare. The most successful and creative people in the world don't possess anything different than you. They have no magic formula or special secret. They've simply prevented the left hemisphere of their brain - the 'logical, ' analytical side - from sabotaging their life. Whether you're a ballerina or banker, accountant or actor, At Left Brain Turn Right shows you how to silence the noise of your left brain, ignite your creative side, and live the life you've always imagined. Using relatable no-nonsense stories from his own creative journey, Anthony Meindl guides you from the left brain to the right to realize your own full creative potential. Anthony Meindl is an award-winning writer, producer, director and actor. As Artistic Director of Anthony Meindl's Actor Workshop (AMAW) in Los Angeles - where the 'right brain rules' - he is endlessly inspired by his students' fearless creativity. AMAW is the #1 acting studio in Los Angeles. Voted Best Scene Study and Best Cold Read by Backstage Magazine 2011. AMAW is also located in New York and Australia. Mr. Meindl is a regular contributor to The Daily Love, Backstage Magazine and various spirituality podcasts. He has been featured in ABC News, Daily Variety, LA Weekly, The Hollywood Reporter and the CW KTLA. AT LEFT BRAIN TURN RIGHT is Mr. Meindl's first book.